Al Mazrouei addresses the event. Hamriyah Free Zone in Sharjah, UAE, has successfully completed week-long road shows in Bangalore, Tumkur and Hassan cities in Karnataka, India. The campaign, “Hamriyah Free Zone – the global choice for investments and business opportunities in Sharjah", has attracted investors from commercial, industrial and service sectors. 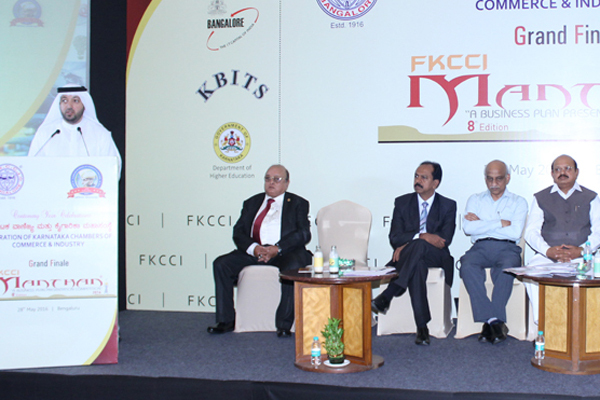 “The road show, which was held in association with Federation of Karnataka Chamber of Commerce & Industries (FKCCI), was a huge success in terms of attendance and enquiries,” said Saud Salim Al Mazrouei, director of Hamriyah Free Zone Authority and Sharjah Airport International Free Zone (Saif Zone). “The shows were held as part of our international promotional tours that aim to strengthen ties and exchange experiences with the business and investment community in India, which is an important market for us", he added. “Majority of our investors are from India and currently we focus more on Asian market as part of our new projects and strategy. The road shows were an excellent opportunity to present various business options and investment opportunities to the South Indian business community," Al Mazrouei added. Al Mazrouei was the guest of honour at "Manthan 2016" grand finale, which took place at Le Meridien Hotel, Bangalore. The ceremony honoured a number of top students who won innovation awards for commercial projects, which was organised by FKCCI.